In natural theology, a cosmological argument is an argument in which the existence of a unique being, generally seen as some kind of god or demiurge is deduced or inferred from facts or alleged facts concerning causation, change, motion, contingency, or finitude in respect of the universe as a whole or processes within it. It is traditionally known as an argument from universal causation, an argument from first cause, or the causal argument. Whichever term is employed, there are three basic variants of the argument, each with subtle yet important distinctions: the arguments from in causa (causality), in esse (essentiality), and in fieri (becoming). The basic premise of all of these is the concept of causality and of a first cause. The history of this argument goes back to Aristotle or earlier, was developed in Neoplatonism and early Christianity and later in medieval Islamic theology during the 9th to 12th centuries, and re-introduced to medieval Christian theology in the 13th century by Thomas Aquinas. The cosmological argument is closely related to the principle of sufficient reason as addressed by Gottfried Leibniz and Samuel Clarke, itself a modern exposition of the claim that "nothing comes from nothing" attributed to Parmenides. Plato and Aristotle, depicted here in Raphael's The School of Athens, both developed first cause arguments. Aristotle argued against the idea of a first cause, often confused with the idea of a "prime mover" or "unmoved mover" (πρῶτον κινοῦν ἀκίνητον or primus motor) in his Physics and Metaphysics. 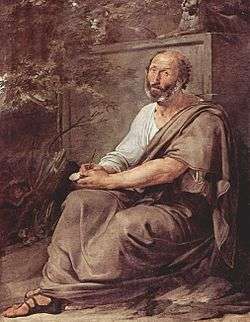 Aristotle's famous argument was contrary to the atomist's depiction of a non-eternal cosmos which, he argued, would require an efficient first cause, a notion that Aristotle took to demonstrate a critical flaw in their reasoning. Like Plato, Aristotle believed in an eternal cosmos with no beginning and no end (which in turn follows Parmenides' famous statement that "nothing comes from nothing"). In what he called "first philosophy" or metaphysics, Aristotle did intend a theological correspondence between the prime mover and deity (presumably Zeus); functionally, however, he provided an explanation for the apparent motion of the "fixed stars" (now understood as the daily rotation of the Earth). According to his theses, immaterial unmoved movers are eternal unchangeable beings that constantly think about thinking, but being immaterial, they're incapable of interacting with the cosmos and have no knowledge of what transpires therein. From an "aspiration or desire", the celestial spheres, imitate that purely intellectual activity as best they can, by uniform circular motion. The unmoved movers inspiring the planetary spheres are no different in kind from the prime mover, they merely suffer a dependency of relation to the prime mover. Correspondingly, the motions of the planets are subordinate to the motion inspired by the prime mover in the sphere of fixed stars. Aristotle's natural theology admitted no creation or capriciousness from the immortal pantheon, but maintained a defense against dangerous charges of impiety. Centuries later, the Islamic philosopher Avicenna (c. 980–1037) inquired into the question of being, in which he distinguished between essence (Mahiat) and existence (Wujud). He argued that the fact of existence could not be inferred from or accounted for by the essence of existing things, and that form and matter by themselves could not originate and interact with the movement of the Universe or the progressive actualization of existing things. Thus, he reasoned that existence must be due to an agent cause that necessitates, imparts, gives, or adds existence to an essence. To do so, the cause must coexist with its effect and be an existing thing. Thomas Aquinas (c. 1225–1274) adapted and enhanced the argument he found in his reading of Aristotle and Avicenna to form one of the most influential versions of the cosmological argument. His conception of First Cause was the idea that the Universe must have been caused by something that was itself uncaused, which he asserted was God. In the scholastic era, Aquinas formulated the "argument from contingency", following Aristotle in claiming that there must be something to explain why the Universe exists. Since the Universe could, under different circumstances, conceivably not exist (contingency), its existence must have a cause – not merely another contingent thing, but something that exists by necessity (something that must exist in order for anything else to exist). In other words, even if the Universe has always existed, it still owes its existence to an Uncaused Cause, Aquinas further said: "...and this we understand to be God." 1 2 3 4 Reichenbach, Bruce (2012). "Cosmological Argument". The Stanford Encyclopedia of Philosophy (Fall 2006 Edition, Edward N. Zalta (ed.) ed.). Retrieved 4 August 2016. ↑ Oderberg, David S. (September 1, 2007). "The Cosmological Argument". In Meister, Chad; Copan, Paul. The Routledge Companion to Philosophy of Religion. Routledge. pp. 341–350. ISBN 978-0415380386. ↑ Craig, William Lane; Sinclair, James D. (May 18, 2009). "The Kalam Cosmological Argument". In Craig, William Lane; Moreland, J. P. The Blackwell Companion to Natural Theology. Wiley-Blackwell. pp. 101–201. ISBN 978-1405176576. ↑ Koons, Robert (1997). "A New Look at the Cosmological Argument" (PDF). American Philosophical Quarterly. University of Illinois Press. 34 (2): 193–211. ↑ Gale, Richard M.; Pruss, Alexander, eds. (March 2003). The Existence of God. Burlington, VT: Ashgate. ISBN 978-0754620518. ↑ Rowe, William L. (1975). The Cosmological Argument. Princeton University Press. ISBN 978-0691072104. ↑ Craig, WL., The Cosmological Argument from Plato to Leibniz, Wipf and Stock Publishers, 2001, pp. 1-5, 13. ↑ Aristotle, Physics VIII, 4–6; Metaphysics XII, 1–6. ↑ "Cosmological Argument for the Existence of God", in Macmillan Encyclopedia of Philosophy (1967), Vol. 2, p233 ff. ↑ "Islam". Encyclopædia Britannica Online. 2007. Retrieved 2007-11-27. ↑ Duncan, S., Analytic philosophy of religion: its history since 1955, Humanities-Ebooks, p.165. ↑ Aquinas was an ardent student of Aristotle's works, a significant number of which had only recently been translated into Latin by William of Moerbeke . ↑ Monadologie (1714). Nicholas Rescher, trans., 1991. The Monadology: An Edition for Students. Uni. of Pittsburg Press. Jonathan Bennett's translation. Latta's translation. ↑ Craig, William L. "The Existence of God and the Beginning of the Universe". Truth Journal. Leaderu.com. Retrieved 22 June 2008. ↑ Cline, Austin. "Cosmological Argument: Does the Universe Require a First Cause? | Agnosticism/Atheism". About.com. Retrieved June 20, 2008. ↑ Clarke, WN., "A Curious Blind Spot in the Anglo-American Tradition of Antitheistic Argument", in The Creative Retrieval of Saint Thomas Aquinas: Essays in Thomistic Philosophy, New and Old, Fordham Univ Press, 2009, Ch. 5. ↑ "Deduction & Induction". Socialresearchmethods.net. 2006-10-20. Retrieved 2012-09-02. ↑ Austin Cline (27 July 2015). "Cosmological Argument for the Existence of God". About, Inc. Retrieved 3 August 2016. ↑ White, David E. "An argument for God's existence". International Journal for Philosophy of Religion. ↑ Calvert, Brian. "Another problem about Part IX of Hume's Dialogues". International Journal for Philosophy of Religion. ↑ Rota, Michael. "Infinite Causal Chains and Explanation" (DOC). Proceedings of the American Catholic Philosophical Association. ↑ Severinsen, Morten. "Principles Behind Definitions of Diseases – a Criticism of the Principle of Disease Mechanism and the Development of a Pragmatic Alternative". Theoretical Medicine and Bioethics. This implies that there is an "infinite" and complex causal structure behind each disease, and that the disease mechanism would have to encompass the whole structure. ↑ White, David E. "An argument for God's existence". International Journal for Philosophy of Religion. My intention is to show that a cosmological argument for God's existence (not that of a first cause simpliciter) can be constructed without appeal to the principle of sufficient reason and without denying the possibility of an infinite causal regress. ↑ Folger, Tim. "Time may not exist". Retrieved August 17, 2012. ↑ Britt, Robert R. (April 18, 2001). "Brane-Storm | Challenges Part of Big Bang Theory". Space.com. Archived from the original on 11 May 2008. Retrieved June 21, 2008.